Finally, after a couple of weeks of gray skies, the sun is shining and the sky is blue. Sunshine makes me happy. 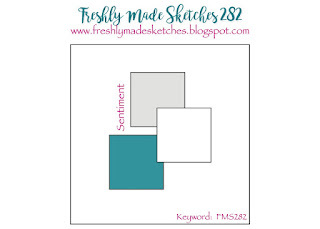 Another thing that makes me happy is combining two of my favorite sketch challenges, Freshly Made Sketches and CAS Colours & Sketches, to come up with this simple thinking of you card to add to my note card stash. As you can see I flipped the sketch and don't you think those colors are so pretty together. One of my newest acquisitions is Stamping Mask Paper. It makes stenciling so much easier as it's sticky on both sides but not the kind of sticky that is permanent so, when you are done, you simply peel it off. For the two lower squares, I used the Stamping Mask Paper and cut out two die-cuts using the Postage Stamp Stacklets Dies. This gave me a stencil that I positioned onto a layer of Whisper White. With my Clarity Stencil Brushes, I brushed Pear Pizzazz ink across the stencil until I had the depth of color I wanted. When I was done, I simply peeled off the Stamping Mask Paper. The third square is cut from Wisteria Wonder using the Postage Stamp Stacklets Dies. 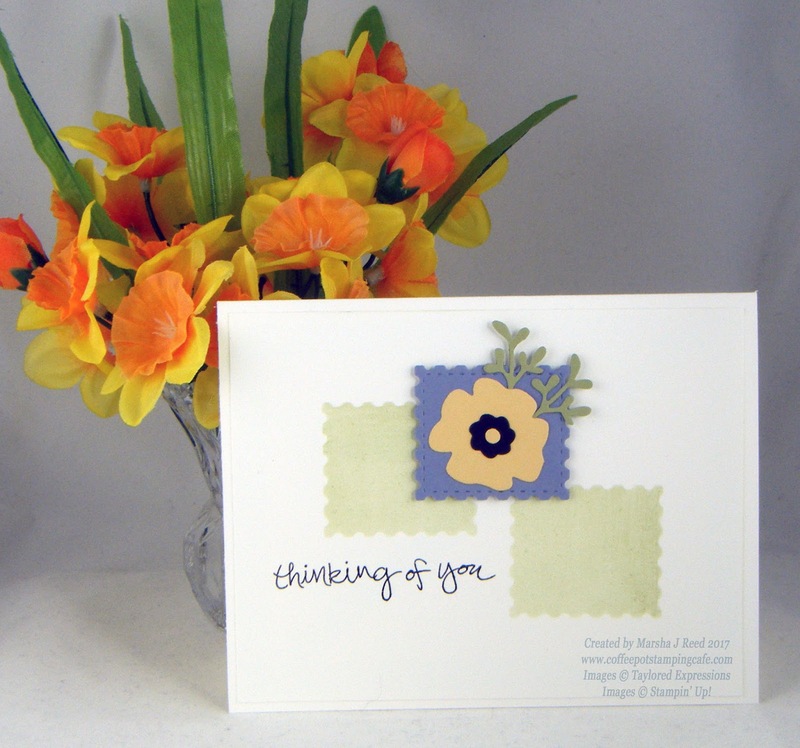 The little flower is cut from So Saffron using the Bloomers 4 Dies as is the small black center of the flower. The little sprigs are cut from Pear Pizzazz using the Flower Box Springs & Flowers Dies. The sentiment is from the Sheltering Tree stamp set and stamped using Tuxedo Black Memento ink. The Basic Black, Pear Pizzazz, So Saffron, Whisper White, Whisper White Thick and Wisteria Wonder cardstock are from Stampin' Up! as is the Pear Pizzazz ink. The dies I used are all from Taylored Expressions. Beautiful card, love how you've used the CC&S colours. Thanks for playing. Very pretty; wonderfully CAS. Thanks for playing along with us at CC&S. Thanks for leaving your comment, Karen! Great card, thanks for joining us at CC&S. Thanks, Samantha, for leaving your comment. Such soft and subtle colors - love your flower and little bits of greenery. Thank you for playing along with us at Freshly Made Sketches. Thanks, Kim! Fun sketch to use. Thanks, Beverley! Love that Stamping Mask Paper.